Hello again. It has been awhile, but this time I make no apologies. We have been busy: working, nesting, living, grieving. We are now firmly planted in our new apartment, and loving it more every day. We’ve built bookshelves, sold furniture, scouted Craigslist in vain for a sofa small enough to fit up the staircase, enjoyed evening strolls around the neighborhood, and Saturday mornings at the farmers market. We lost a very dear friend to the darkness of PTSD. In the aftermath we have spent time enjoying one another, making the most of every moment we are blessed to have together. We have been reminded to appreciate our friends and family, and to invest in those relationships more intentionally. The transition from winter to warmth, combined with the hectic and the sad, has brought inventive cooking to a standstill. I have again fallen back to the well known, the easy to produce, comfortable in familiarity. Though it isn’t earth shattering, I thought I would take a moment to share one of those easy everyday recipes with you, something you can throw together when all you really want is time to enjoy the people around you, while providing a good meal. First, find the joint between the lower wing and the wing tip (the pointy bit with no meat on it). Find the point where the joint flexes and cut in between. It may take a few tries, but you will know you’ve found the right angle when the knife doesn’t meet much bone resistance. Now, same with the upper wing and lower wing. Flex the joint between the two. Start cutting through the flap of skin, aiming down toward the knob at the bottom of the upper wing (the part that looks like a miniature drum stick). Once you’ve gotten there, you will see the elbow joint, a rounded white knuckle of bone. Cut under that. Now, practice! Heck, if you don’t get it right with the first full batch (or five), the things are still edible. Just make sure you don’t have any little bone fragments attached to your cut pieces. Rinse, if necessary, and pat dry. Line large baking pan with parchment; do not use foil because the meat will stick and tear. 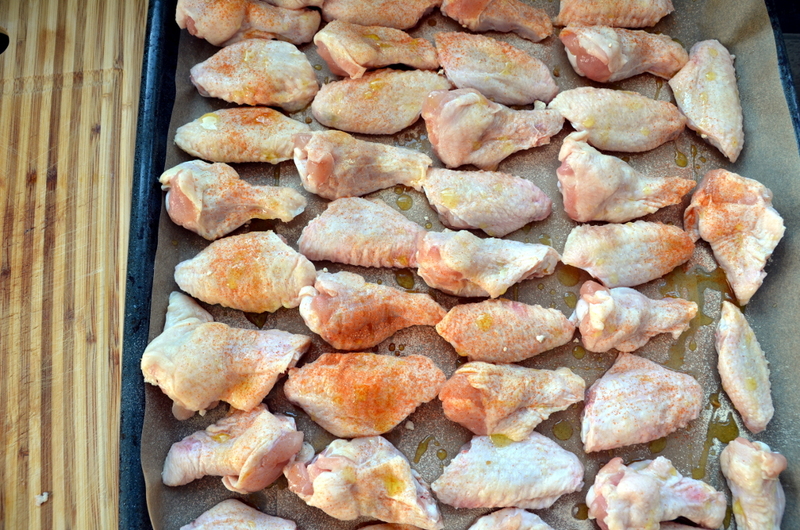 Dust prepared wings with cayenne and garlic powder. Drizzle with olive oil. Place in oven and bake for 15 minutes. Turn oven down to 375; bake for an additional 20 minutes. Check for doneness (no pink). Meanwhile place 1/2 cup hot sauce and 1.5 tablespoons of butter in a large pan. Heat over low to melt butter and combine. 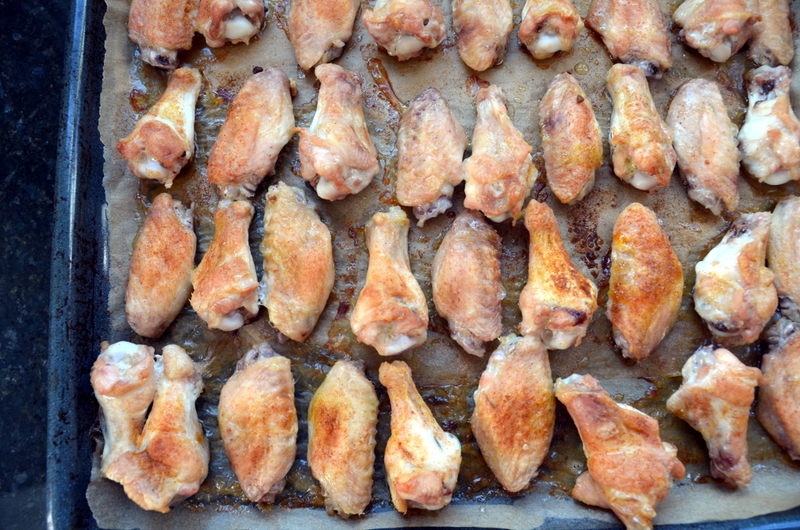 Remove wings from oven and transfer to pan. Toss (or carefully turn) in sauce to coat. 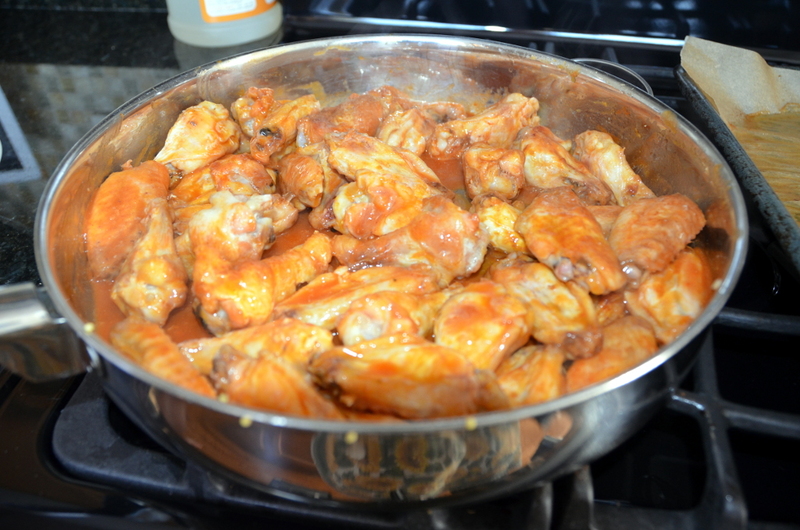 Heat until sauce is slightly thickened and wings are fully coated. Serve with lots of napkins! 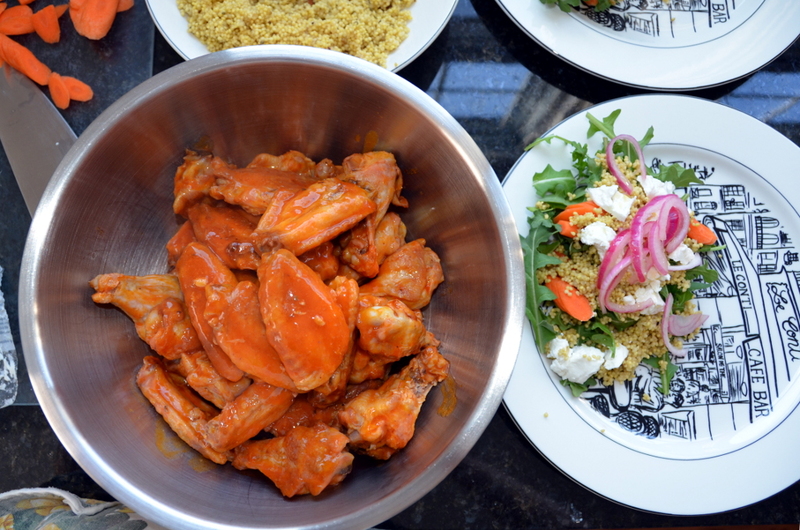 I’d love to know: What is your favorite meal to share with family and friends? Tell us about it in the comments below. This entry was posted in dinner, gluten-free, lunch, meat, poultry, recipes, Uncategorized and tagged chicken, gluten-free, recipes on May 22, 2013 by Brandy. I’m glad you’re both enjoying the new digs. Any news on the allergy front? This week I’ve finally decided that I do see a positive difference since we moved. Thanks for asking, Joe!